No ‘hotkeys’ or overwhelming order windows, ‘myPosition’ intuitively always waits on the right edge just near current price ready to be used. Position size is calculated based on your customized settings. You can choose one or two targets, risk a percentage or fixed amount and it works on any currency or instrument. 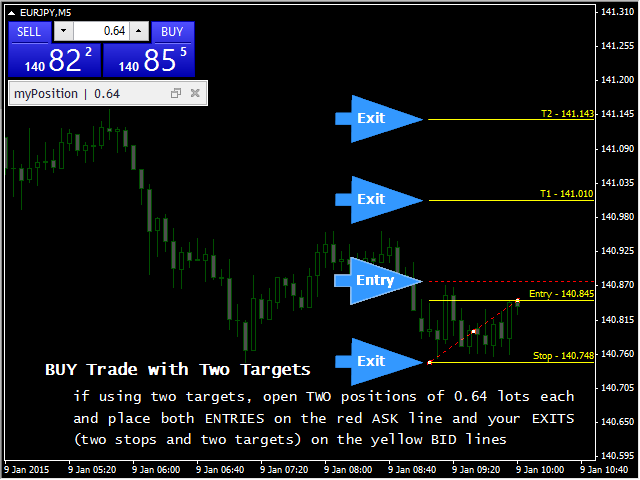 ‘myPosition’ instantly adapts and harmoniously alters your Stop, Entry, Target and Position Size in relationship to one another while you plan your trade by moving ‘myPosition’ on the chart. Never before have you been able to see your set-up with such transparency. It reduces stress and ends all errors caused by tedious time consuming manual tasks to almost ZERO and makes planning the next trade FUN. ‘myPosition’ tool works as a standalone product, highly customizable to your trading needs, from scalping to positional trading, on any time frame. 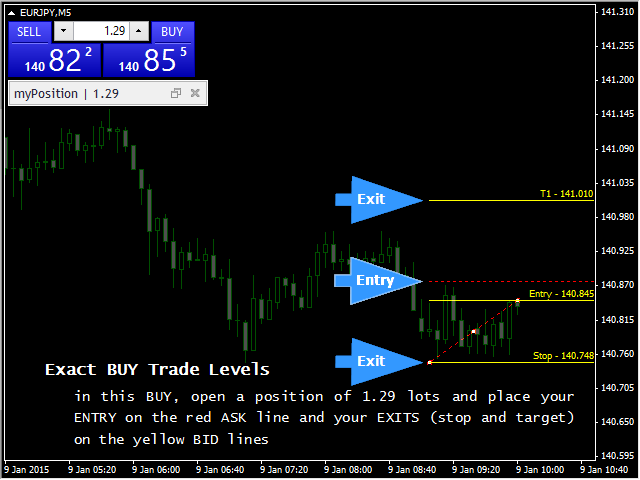 Optionally you can add ‘myEntry’ for a complete trade entry system. All levels graphically shown on chart. Executes 1 or 2 part positions. Calculates position size based on: (a) fixed amount (b) percentage risk of account balance, equity or free margin. Calculates the TRUE Risk to Reward by including the spread. Draws the CORRECT Bid and Ask price on the chart through Yellow BID line and Red dotted ASK line. Intelligently alters for Buys and Sells. 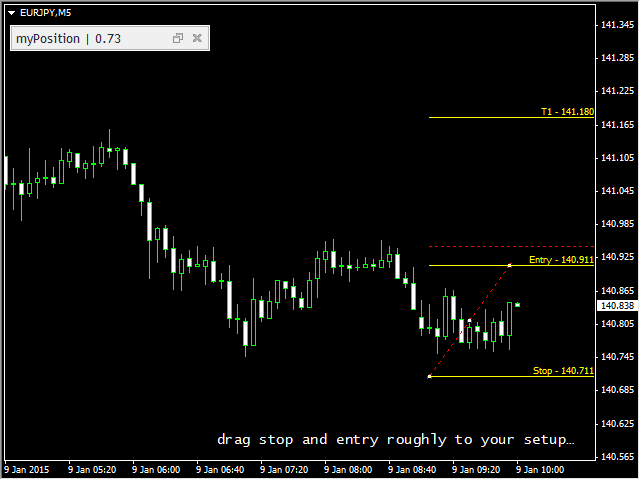 Customize ‘buffer’ pips for your entry and stop beyond a candle or price pattern. Suitable for every trader on any timeframe. Can be used for Stop and Limit Orders. Can be trialed in Strategy Tester for free. Drag stop and entry roughly to your set up. Click ADJUST button, size, entry and exits are precisely taken care of. Risk a total of 2% of your account balance per trade with a two part position, targeting a minimum of 1:1 for position 1 and 2:1 for position 2. Risk (2.0)—The percentage you want to risk, or a fixed money amount, eg 2% of account balance per trade or $100 per trade. RiskMethod (1)—1 = percentage of your balance, 2 = fixed amount. AccountSizeMethod (1)—Decides if it percentage risked applies to 1 = Account Balance, 2 = Account Equity, 3 = Free Margin. This parameter is ignored if risking fixed amount of money. Target1RR (1.0)—The amount of profit in relation to risk. Eg 1:1 target set to 1.0, 2:1 target set to 2.0 etc. Target2RR (2.0)—Same, but setting target for your second position. If only trading one part position set this to 0. EntryBuffer (0)—Number of POINTS your entry level will be adjusted to beyond a candle or pattern after you click ADJUST in ‘myPosition’. If your broker uses 5 digits 10 points will be 1 pip. 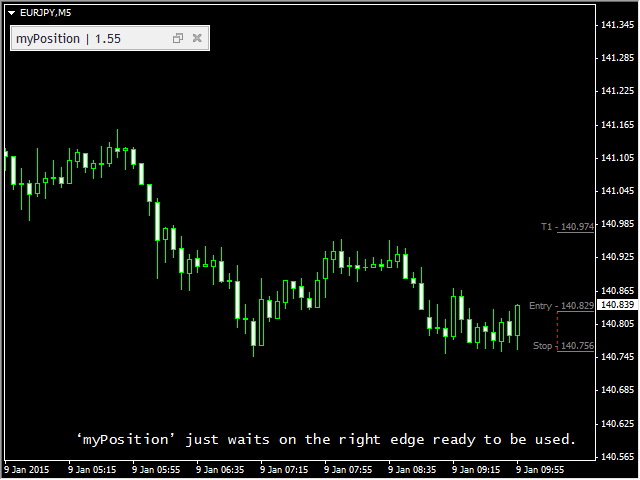 StopBuffer (20)—Number of POINTS your stop level will be located behind a candle or pattern after you click ADJUST. 20 POINTS will be 2 pips if prices show 5 digits. 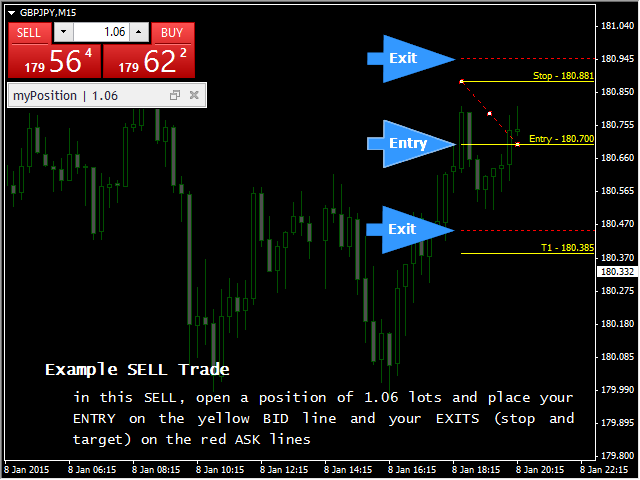 ShowPrice (true)—Displays entry, stop and exit price on chart. ShowAsk (true)—Displays the ASK price level as red dotted line, indicating where to put your orders to accommodate for spread. 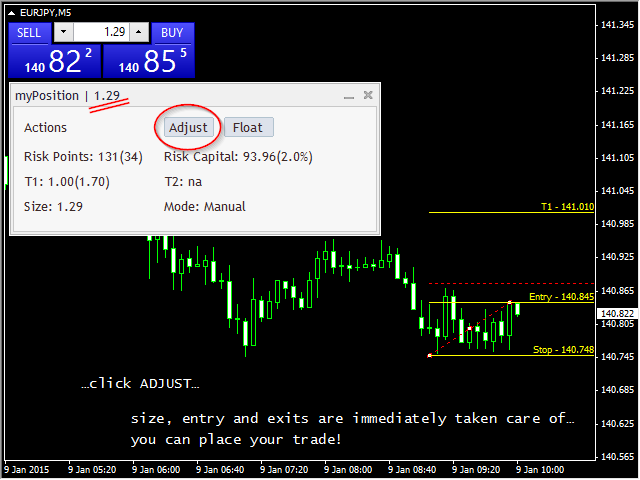 ShowComment (true)—Trade parameters are shown on top of chart. Floating_Offset (20)—Space between current candle and floating tool to the right. NOTE: If you prefer to not include the spread into your order management, you need to select ‘false’ on both ‘AdjustRiskForSpread’ and ‘AdjustRewardForSpread’. Not recommended. Small update to increase performance.